He Was Gone For Years. 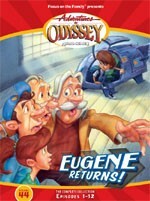 But now … Eugene’s Back! "A Most Amazing Event" (7-12). Find out why Eugene was gone so long — and what happens when he and Katrina finally get married!